We provide a complete service: prepress, offset printing, graphics processing, digital printing variable data, the machine insertion into envelopes and delivery according to the order of the client. Following the "One-Stop Shop"principle, we specialize in producing documents, information and publicity mailers. The client's only task is to process the data and deliver them to us. We will do the rest (prepare the pre-printed material, envelopes etc., develop printing software, perform data printing and inserting) in the shortest possible time, guaranteeing security and confidentiality of the client's data. Our equipment for variable data printing enables various data printing following the client's request for the purpose of direct communication with his customers, invoice issuance, other notifications and promotional purposes. Personalized materials are inserted into appropriate envelopes by means of a machine, using inserting equipment. In addition to these, various promotional materials (leaflets, brochures, etc.) and other enclosures may be inserted into envelopes at the same time as well. The specificities of processing certain clients inevitably led to the development of our own software solutions for acceptance, processing and printing of documents and the like. Experience in previous projects and adjustment to the existing treatment process of a single client has become a basic work method regardless of the type of data, media, operational system or equipment used by the client. Personalized data printing is performed on pre-printed forms (memoranda, payment slips, letters, etc.) or on various forms of self-mailer. Personalization may vary from the simplest (address printing on a pre-printed form or envelope) to highly demanding printing of completely different data for each individual recipient of a specific material (invoices, bank statements, reminders, various announcements, offers, etc.). We also perform personalization of PVC ID and loyalty cards, as well as data recording on CDs/DVDs and their copying. One of the most important things for each client is protecting confidentiality of his data and information, security, and continuity. All this is guaranteed through the implementation and continuous development of information security management system according to international standard ISO 27001. Our inserting machines are equipped with the most sophisticated devices (special cameras) at the input and output units, and software equipment providing the accuracy of inserting personalized materials into envelopes. Inserting machines read a code (OMR, bar code, 2D-Datamatrix) on a document and automatically insert relevant documents, leaflets, brochures, and other enclosures in the envelope. Monitoring and recording of input data and matching the output data on the very envelope is provided through data logging. One hundred percent accuracy of the envelope content is achieved this way. Various personalized promotional materials may be inserted in all sorts of so-called dimensional mailers (different packages, boxes, covers, etc...), following the client's choice and request. We also provide the service of completing and preparing the materials for shipping through shipment distributors, that is, other forms of delivery to the end customer, following the client's order. If the client wants ready-made print solutions, we offer solutions for variable printing based on the database given and document templates. In order to facilitate communication with the client and improve monitoring during processing, we use our own tracking system via the web. The client connects to the web and, following a successful logging into the system, gets an accurate insight into the status of the work. We provide 24-hour monitoring of every process in the moment of print completion, inserting into envelopes and equipment as well as the quantity of shipments for each given order to all interested users,. We offer prepress service for all your needs, whether you need designing and creating a new prepress, or customize the existing one for printing. Our graphic machines enable developing the most diverse printed materials on different types of paper (copy paper, non-copy paper of various weights and structures) and in various final forms (sheets, infinite roll, sets, blocks, rolls, etc.). At graphic finishing department we create a finished product from printed sheets. For printing, we mostly use ready-made graphic prepress provided by the client. If you do not have a ready-made graphic prepress, you may contact us and our experts will create it according to your requirements. Prepress formats the contents of the information following a template defined by the client (text, illustration or image processing, integrating them in the text, and more). Prepress is done on the computer connected directly to the CTP device (Computer To Plate), which prints data to the offset plate, that is, print form and on to the graphic machine where offset printing is done, or by means of direct printing from the computer (Computer To Print) when it comes to digital printing. business forms: memoranda, receipts, forms in multiple copies on copy papers on infinite tape, sets or blocks, offers, contracts, work orders, travel orders, payrolls, data mailers, forms, sequential numbering, etc. 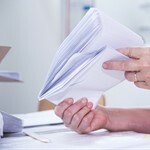 paper processing or paper products: paper shaping in folders, notebooks, blocks, wobblers, etc. Print Center Krapina d.o.o. was founded in 2000. The main business activity is printing, personalization (variable data printing) and inserting into envelopes. Following the "One Stop Shop" principle, we offer our clients a full service: prepress, printing and finishing on graphic machines (classic offset printing), variable data digital printing (MDR), machine insertion into envelopes and delivery following the client's order. Through this kind of business orientation, Print Center Krapina has been, from the day of its founding, the first legal entity in Croatia to offer such a complete service for systems such as telecommunications, banks, leasing companies, housing savings, utilities, insurance companies and others who are in need to distribute certain documents, personalized information, promotional campaigns, etc. (direct mail) to their existing and future clients. Today we are the best-equipped legal entity in the Republic of Croatia for the performance of these services following the "One Stop Shop" principle and occupy a leading position on the Croatian market. Our mission is to become and remain "Your partner in doing business". To this end, we develop human and material resources, and processes on daily basis to provide you with the highest quality product and service in the shortest possible time, with maximum security and maintaining the confidentiality of information and client data. Production processes are carried out in accordance with international standards of quality management defined in standard ISO 9001, Information Security Management defined in standards ISO 27001 and environmental management defined in standards ISO 14001. The establishment of these systems, their continuous effective maintenance and improvement represent the basis for establishment, maintenance and continuous development of the organization's ability to deliver products and provide services in accordance with clients' requirements, statutory and regulatory requirements. The Personal Data Protection System is established and maintained in accordance with applicable information security standards within the ISO 27001 - Information Security Management System. Compliance with the General Data Protection Regulation shall be confirmed by a specific certificate whenever possible. Share capital: 2,000,000.00 kn paid in full.